A delegate in C# can be conpared to a function pointer in C and C++. It allows programmers to specify what the funtion to be called will look like without having to specify the particular function. A delegate is a reference type variable that hods th reference to a function, which can change at runtime. Delegates are very useful when programing UI controles where events have to be implemented for callbacks. The above code works perfectly in most situaition. However, there may be sometimes when we dont’ want to call a function directly. We need to pass it to some ohter method to call it. This would be neccessary in an event driven system sucha s a graphical user interface applicaiton. In this case we would like some code to be executed when a user clicks on a button, or when I want to log some informaiton but cannot at the moment specify how it would be logged. 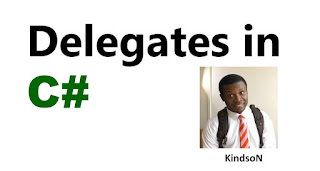 Declaration of delegates determines that methods that can be referenced by the delegate. For a delegate to refer to a function, the function must have the signature of that delegate. The delegate declare above can be used to reference any function that has a single string parameter and returns an int type variable. After a delegate have been declared, a delegate object msut be created with the new keyword and be associated with the a particular method. When creating a delegate, the argument passed to the new expression is written similar to a function call, but without arguments to the function. In the above example, a delegate called writeString() is delared that takes a single string. The function below illustrates how to delare, instantiate and use delegates to reference functions that take int values and returns int values. In the above code, a delegate is created called NumDelegate that would point to a method that takes an integer parameter. In the main program, three delegates are instantiated nd, nd1 and nd2. At the end of the program the output would be 65.